Here to share another card that I made. 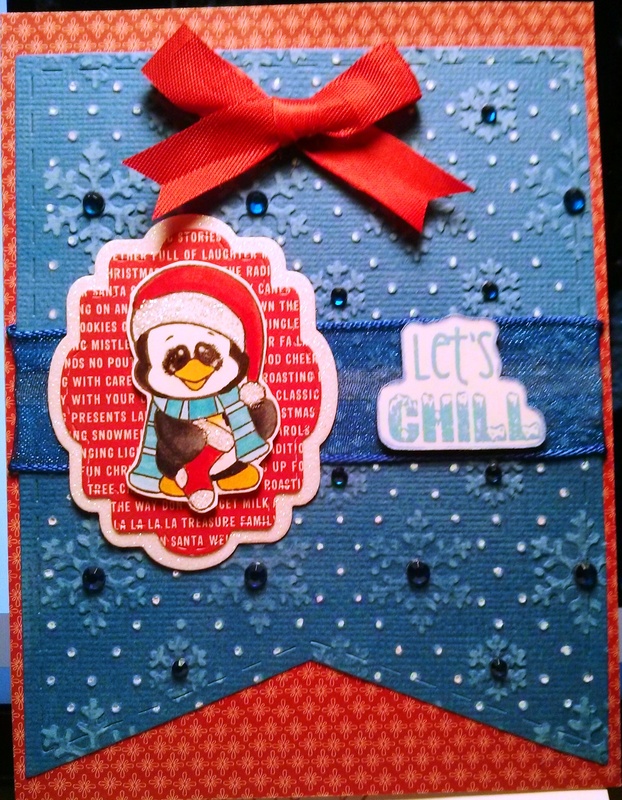 The adorable penguin and sentiment is from Craftin Desert Diva’s “Chill Out” stamp set. Included both pics as one shows the sparkle better than the other one. I stamped the little penguin with Memento Black Tuxedo ink and then coloured it in with a mixture of Copics and Spectrum Noir markers. Used some DecoArt Glamour Dust on the hat and top of the stocking. To make the eyes shiny, I used Glossy Accents. 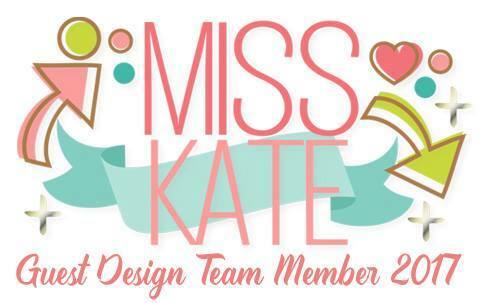 The die cut frame was done with my Cuttlebug and the die from Craftin Desert Divas “Banner Dies”. 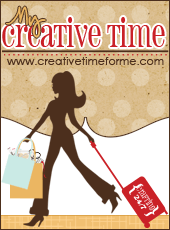 I used Sizzix Tim Holtz Alterations Snowflakes for the snowflake patter and AC Cardstock. After embossing, I used some light sandpaper to make the snowflakes stand out more. Then I added some blue gem stones. To make the snow, I used Gelly Roll Sakura #8 pen. 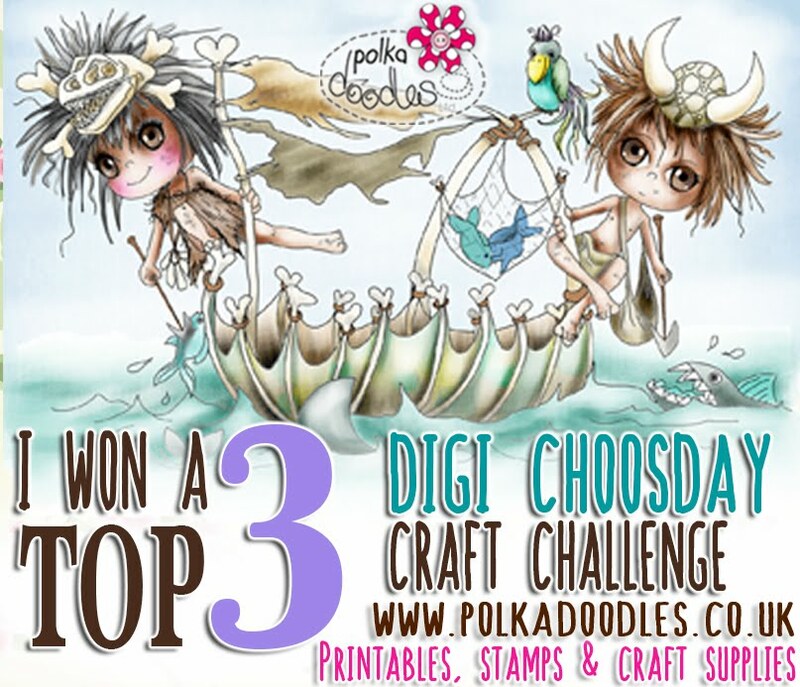 The design behind the penguin is from My Creative Time – “Stitched Belly Band Deies”. The patterned paper background is from “Home For Christmas” Paper pad 6″ x 6″ pad. The card base is white card stock. Back to share a Christmas card that I made this past weekend. 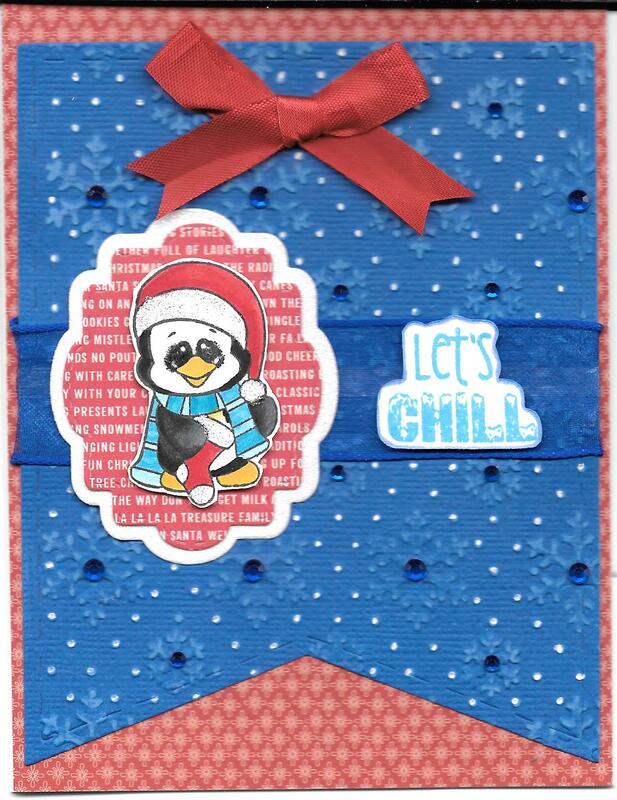 The adorable penguins are from Craftin Desert Diva’s “Chill Out” stamp set. I just fell in love with these little characters. I stamped the little penguins with Memento Black Tuxedo ink and then coloured them in with a mixture of Copics and Spectrum Noir markers. To make the eyes shiny, I used Glossy Accents. Also, first coloured in the little tree balls and then added some coloured “Stickles”. 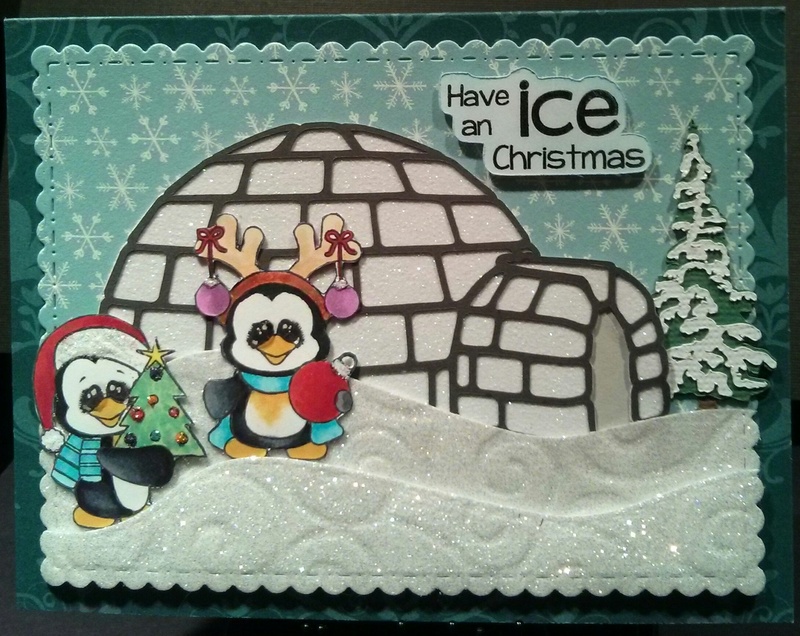 To make the igloo from “Go Canada”, I used Cricut Design Space and my Cricut Explore, black, gray cardstock and Glittered Christmas Cardstock for the white. The tree to the right of the igloo is from Miss Kate Cuttables. 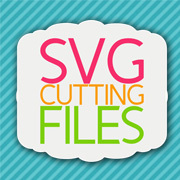 I really love this little tree and with being an .svg file, I can make them all different sizes. Added some Wink of Stella – Glitter White to the snow on the tree. Unfortunately, it does show up that great in this pic. Added some “Sookwang Be Creative” double sided tape over heavy weight white cardstock by AC Cardstock to make the snow using my Cuttlebug, embossing folder “D’vine Swirl”. Next, I die cut the snow with Craftin Desert Diva’s “Outdoor Landscape” dies. After that, I peeled off the top layer of the tape and sprinkled DecoArt Glamour Dust onto the embossed image. I felt this gave the snow more sparkle. The die cut border was done with my Cuttlebug and the dies from Craftin Desert Diva’s “Fancy Frame Dies”. 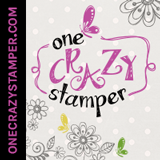 The patterned paper is from “Home For Christmas” Paper pad 6″ x 6″ pad. 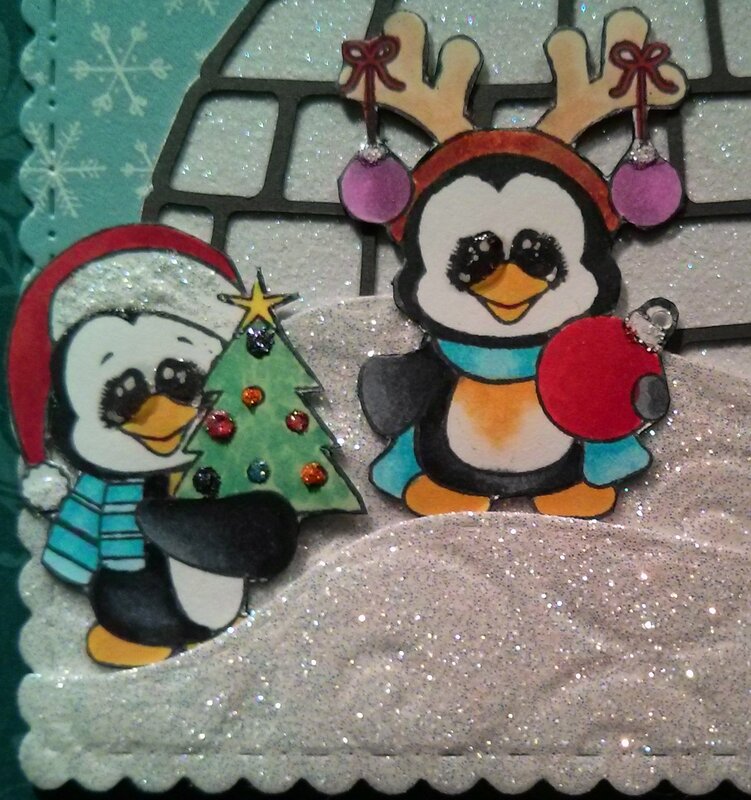 I also used this die cut on the Swirly snow base as well. The card base is from Recollections “Frost” Card and Envelope set. 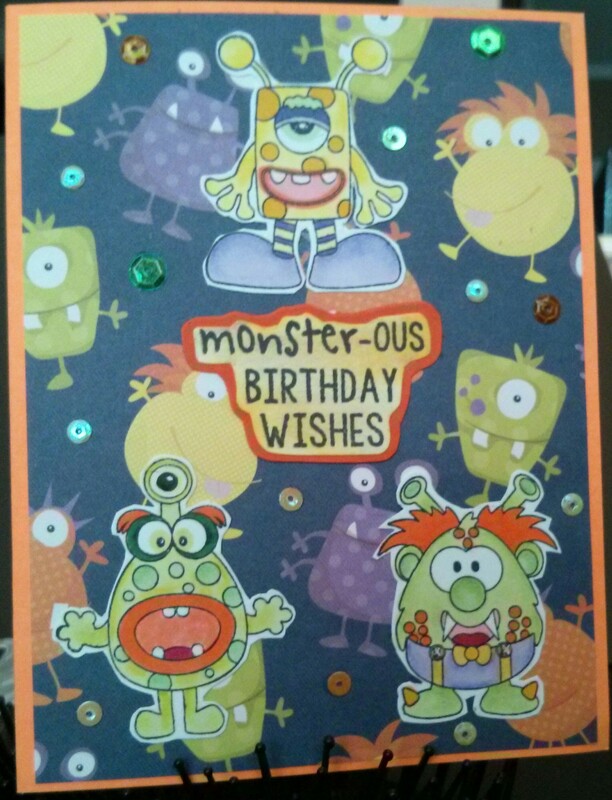 Back again to share a Monster Birthday card that I made using some stamps, dies and sequins from Craftin Desert Divas. 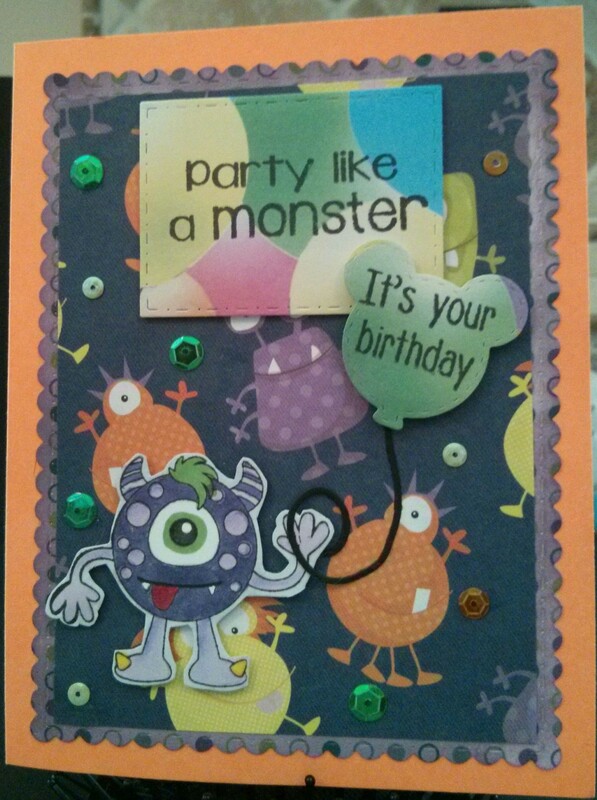 Craftin Desert Diva’s Fancy Frames, Party Dies, Monster Mania stamp set and Corn Maze sequins. 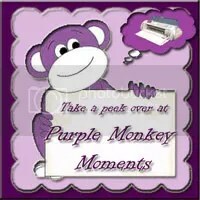 I also used Cricut Design Space and my Cricut Explore to die cut the images for the Monster Mania stamps from an .svg file of the same name. Next, I cut paper pierced the monsters. I had some Monster paper and balloon paper on hand and thought it would go great with this stamp set. Images were coloured with Spectrum Noir Markers and PrismaColor Premier Pencils with Gamsol. I really loved this set. It was so much fun to create with.